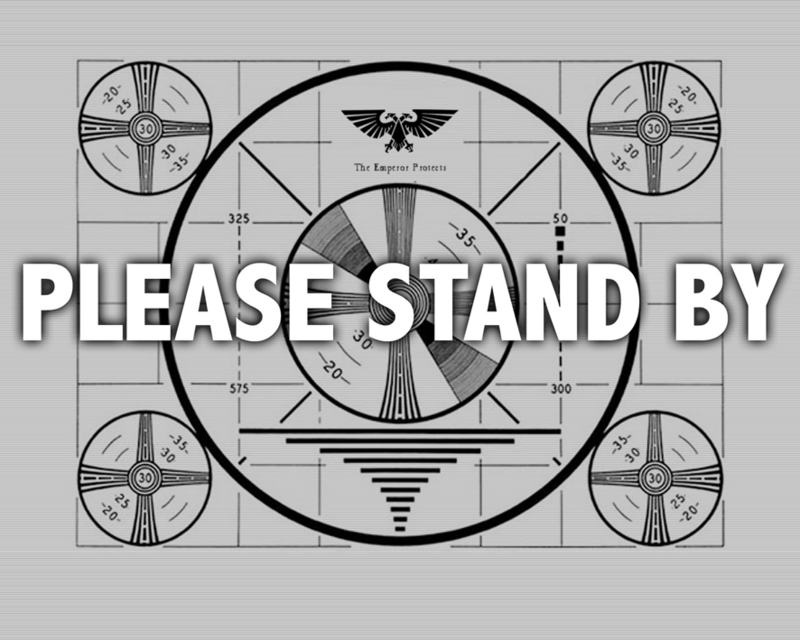 The cavernous chamber rang with the sound of a thousand hammers striking an anvil. Flames blazed in the furnace at the end of the hall, casting their haphazard light across the countless trophies and weapons arrayed on the monumental walls, creating an ever changing play of jagged shadows. One by one, the hammers fell silent and the assembled hunters waited. With the sound of grinding metal, Khoron the Undying, Keeper of Trophies, strode from the shadows to where a bier had been placed. On it lay the dead body of Huntmaster Ferax, his armour torn and broken in a hundred places, his pale flesh still smeared with both his blood and that of his enemies. Ferax had finally collapsed amidst a circle of corpses, with all of his assailants dead around him, before he had allowed himself to die. Now he was cold and dead, his scarred features strangely peaceful. Nothing but silence greeted Khoron’s challenge: Ferax had been a champion of the company, and nobody would have dared to doubt his prowess. After a moment of silence, Khoron turned away from the hunters “It is time”, he rasped. 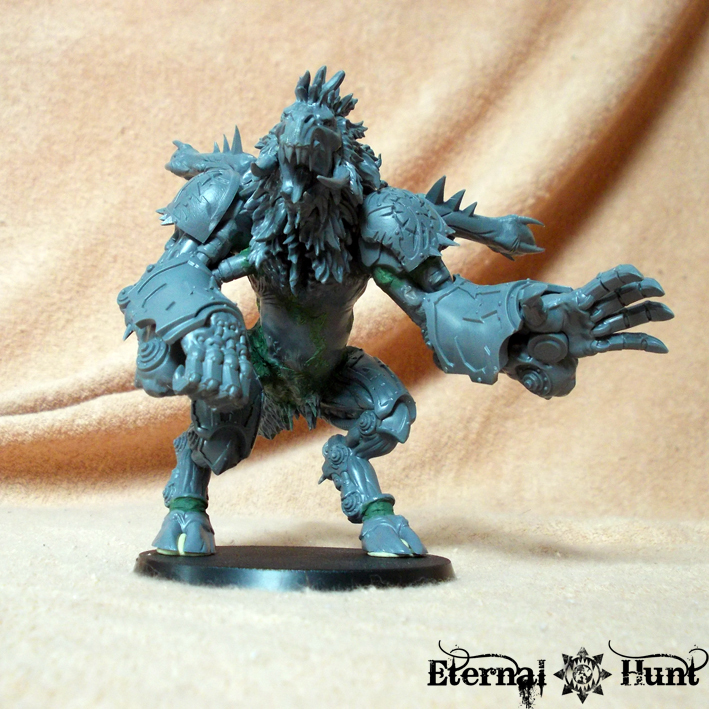 From the shadows emerged Huntmaster Torus, the Taker of Skulls. His face was gaunt and entirely without expression, his eyes hooded in deep shadow. With the soft scraping of armour, Torus hefted his enormous axe, and with one swing, ritually severed the corpse`s head. Then the bier holding the now headless body slowly glided towards the furnace. “He broke his chains and knew freedom”, Khoron boomed. “He died a free man”, came the answer of the hunters. As the final words were spoken, the body had been completely engulfed in the flames of the furnace. The flames played in the eyes of the assembled Astartes, and all was silent once more. 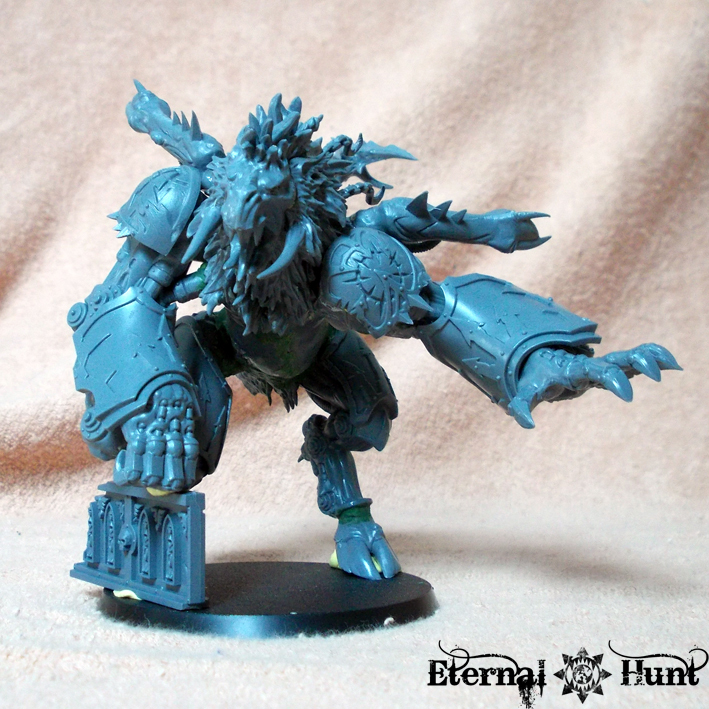 Lord Lorimar’s abyssal growl matched that of the ancient dreadnought. Five hunters moved into the light, each of them stripped to the waist, their triumph ropes plain for all to see amidst their corded muscle and scarred flesh. They were Ferax’s lieutenants, each of them now a contender for the position of Huntmaster. In the dim firelight, their faces were masklike and unreadable. “And evermore shall be so” , came the murmured reply of the assembled hunters. 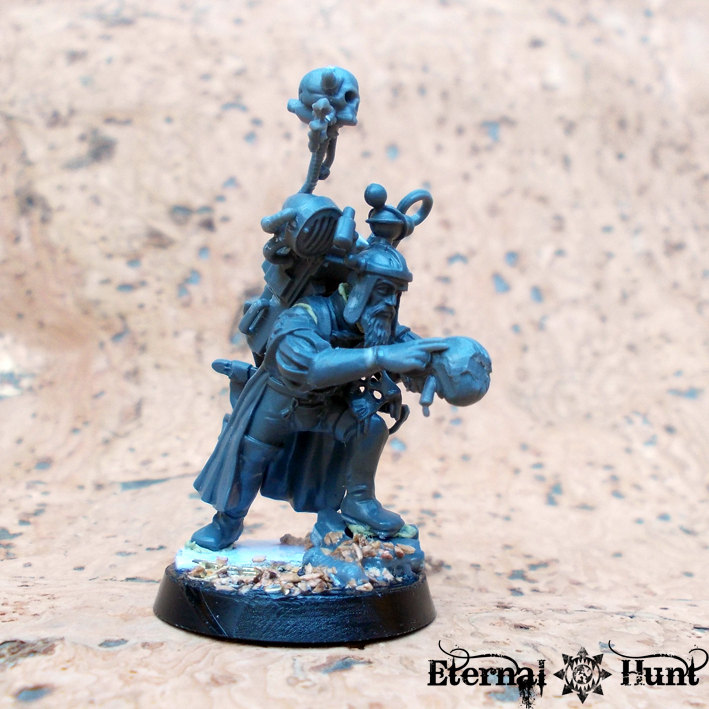 Those of you who have been following this blog for a while may already have asked themselves: What about all that INQ28 jazz? Any news? And indeed, it was with a bit of a shock that I realised how long it has been since I last showed you some servants of the Ordos. 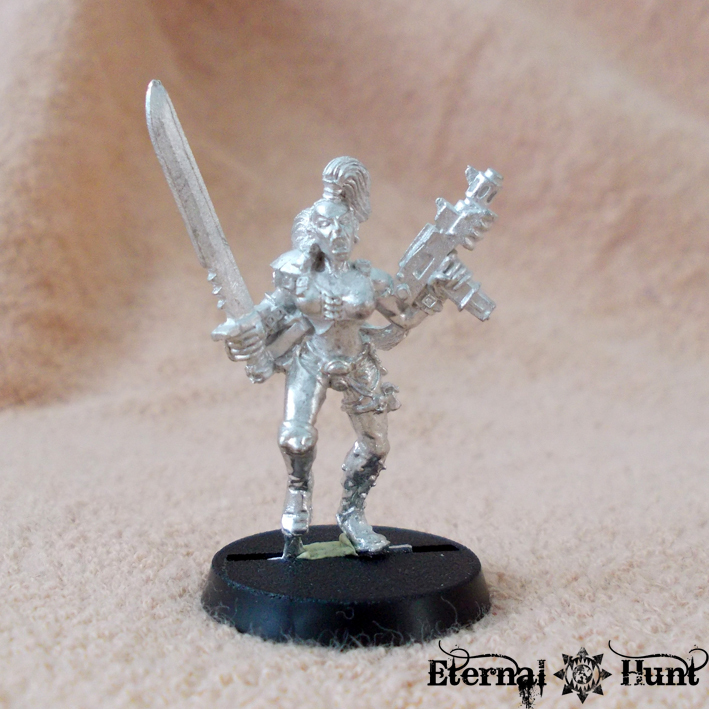 Well, fear not, because I’ve recently begun to get some more work in on my various INQ28 retinues. Some of the following models may already be known to those who also frequent my forum threads, but that’s really all the more reason to post them here as well. 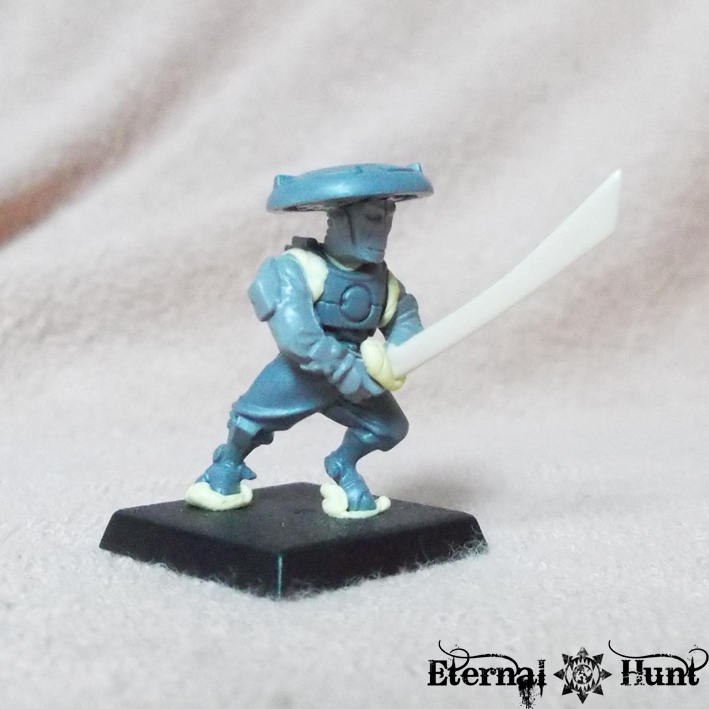 Plus I could really use the relaxing effects of painting an INQ28 character or two at the moment, so there may be a couple of updates soon (I hope!). 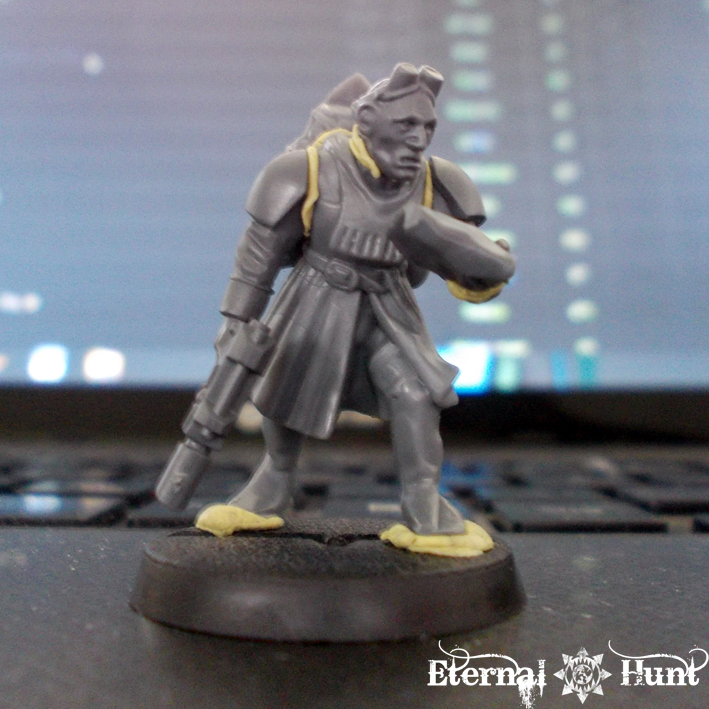 Anyway, today I would mainly like to focus on the retinue of Inquisitor Titus Alvar, a member of the Ordo Xenos. I like the big gun and the “tough as nails” look and imagine this is the kind of guy Alvar makes use of when negotiations turn sour and diplomacy is no longer an option. 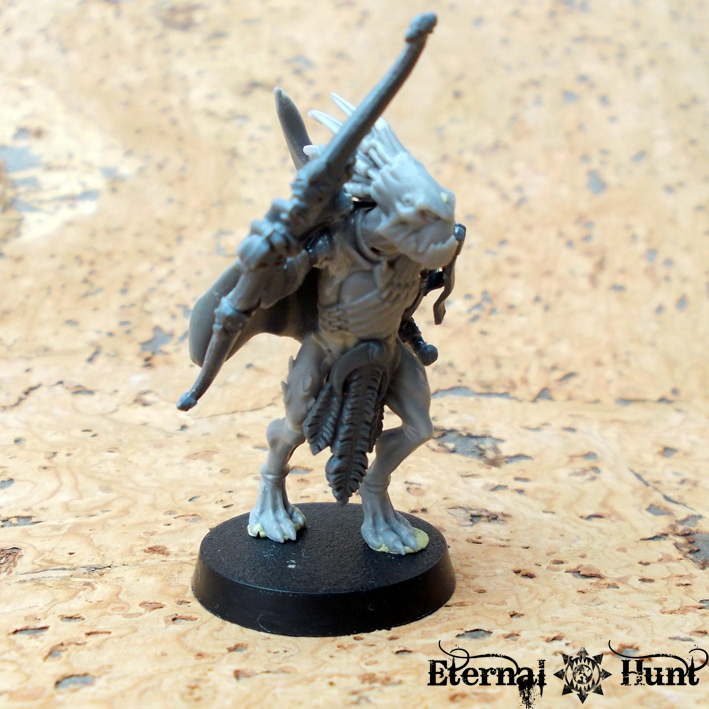 Kroot Pathfinder T’l’kess lost his entire kindred in an atrocity committed by a Tau officer (it’s a long story). He realised that his last chance to keep his bloodline alive might be to travel the stars in order to find members of the brood who left the planet prior to the genocide. 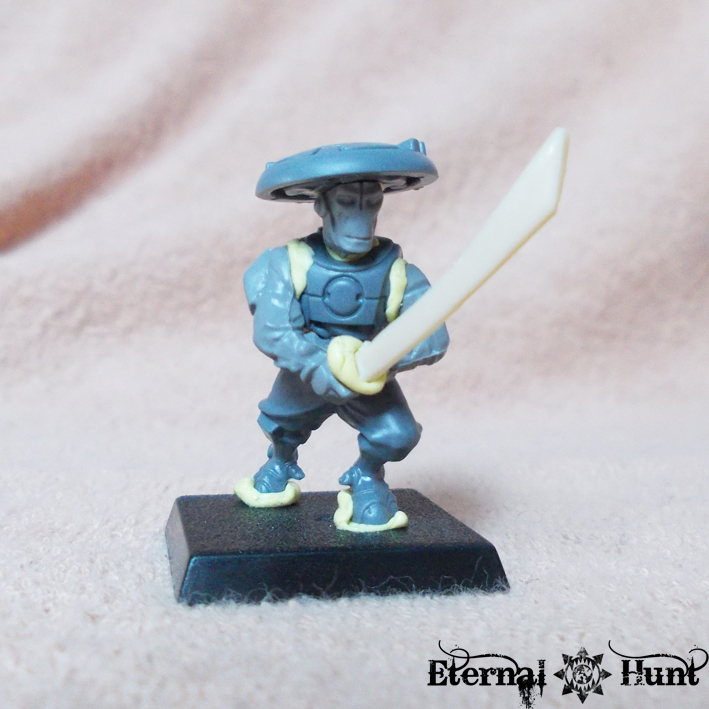 During his travels, he met Inquisitor Alvar whom he now serves as a scout and pathfinder. 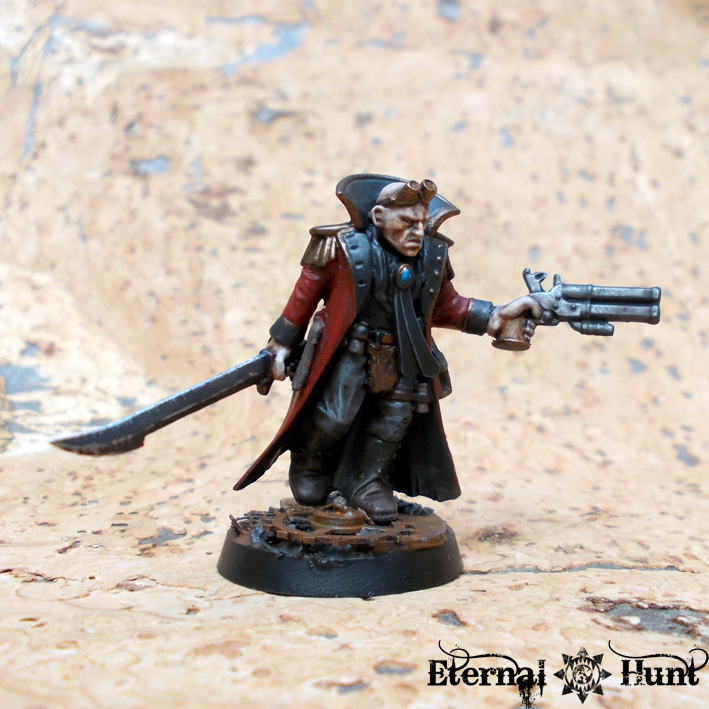 Professor Abelard Marbray, of the Bastold Imperial Akademy, formerly one of the sector’s pre-eminent specialists on Xeno-archaelogy. That was before his scientific theories on the warp affinities of certain Xenos were shot down by Inquisitor Alvar at a social function, which rendered him the laughingstock of his colleagues. 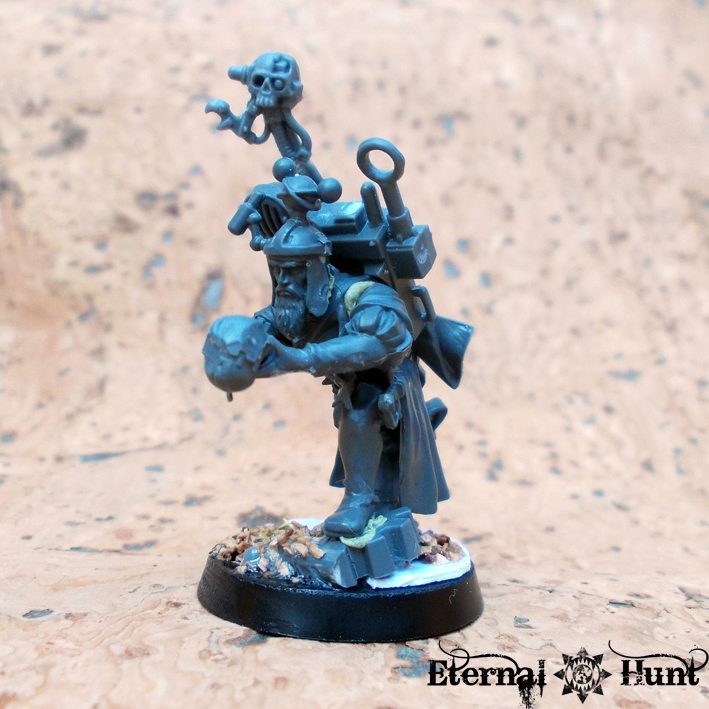 Alvar visited him afterwards, revealing that all of this had been a conscious move to discredit the Professor, since his theories had been too close to the truth for the Ordo Xenos’ comfort. The Professor was outraged at this, yet when Alvar offered him to join him – not to attain academic merits, but to learn the actual scientific truth – he eventually accepted. 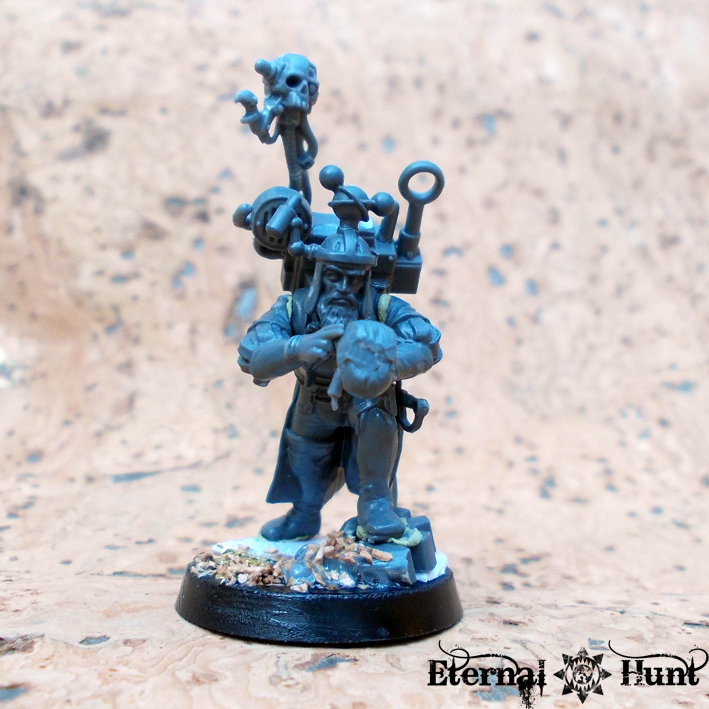 The rather frightened looking head from the Celestial Hurricanum kit seemed to be a perfect fit for him, plus it also creates a visual connection with Inquisitor Alvar, which I like. The model still needs some additional detail work, of course, but I think it already works reasonably well. 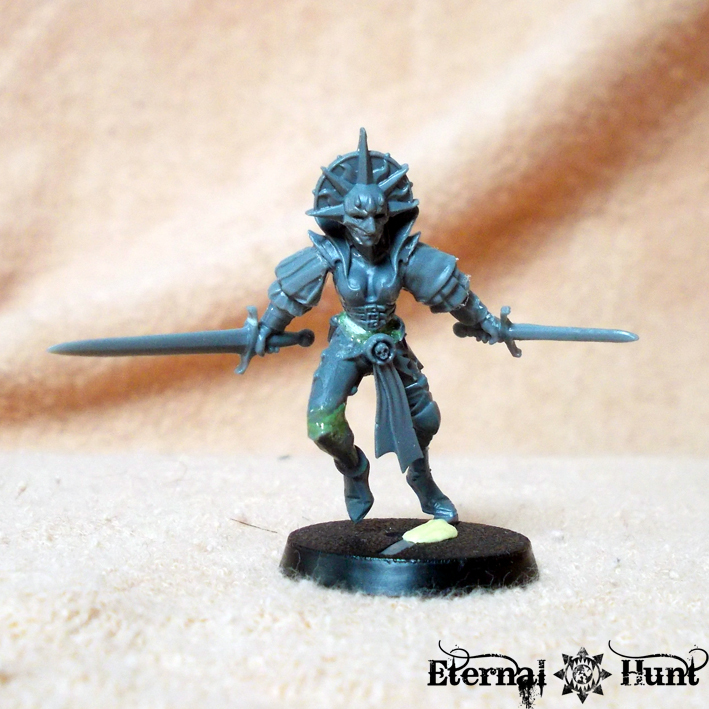 I normally stick to GW models, by and large, but in this case, I made an exception: I have loved this particular sculpt for a long time, plus I think she makes an excellent addition for an INQ28 warband. 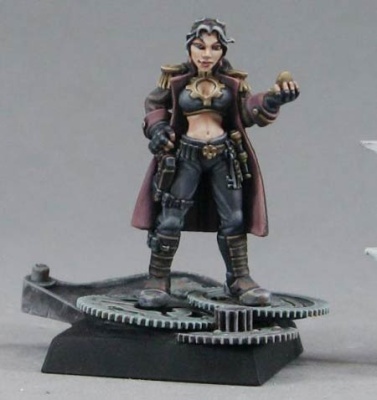 Granted, she may look slightly “stripperiffic” with that bared midriff, but it should be easy enough to paint that area as covered by a bodyglove. 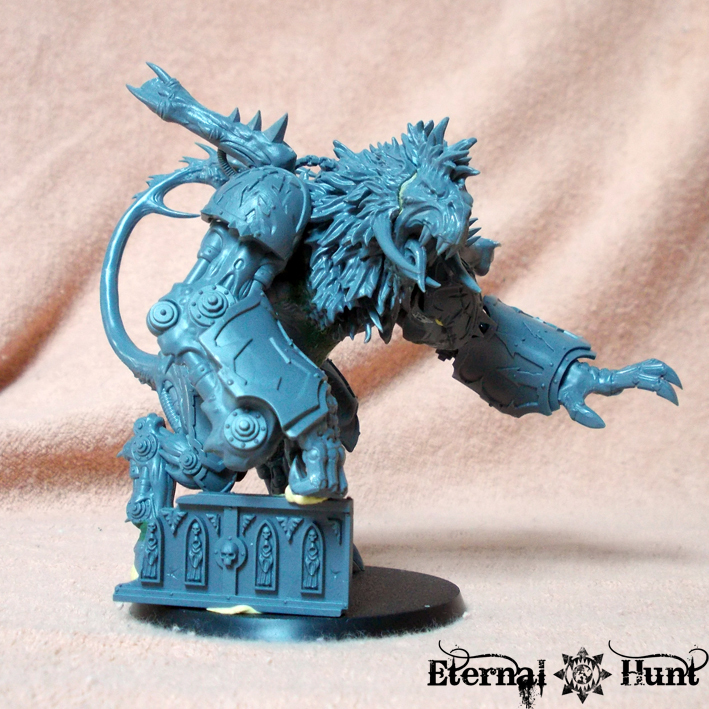 Here’s a link to a very nice, painted version of the model. 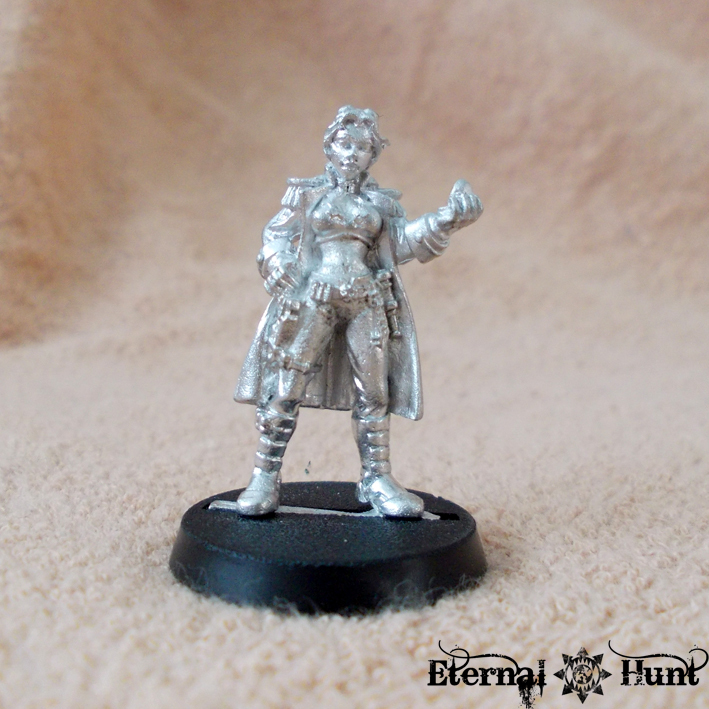 My plan for now is to call her Millerna Acheron and use her as an Interrogator for Inquisitor Alvar: It suits his character to have an attractive woman around as his assistant. At the same time, he’s shrewd enough to consciously give the impression that he just chose her as a pretty face to accompany him. So those are the members of Inquisitor Alvar’s retinue so far: I think it’s a rather interesting cast of characters, and it will be fun to further flesh them out. 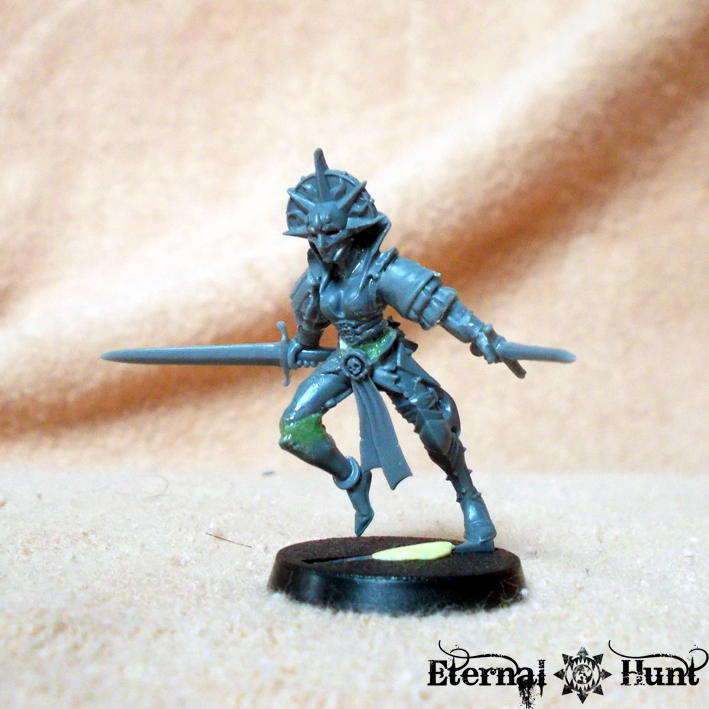 It’s also remarkable how things just started falling into place once I had begun to work on the warband! Of course I’d like to hear any suggestions you might have! I now see her more as a bodyguard than a cultist, to be honest: I believe her ostentatious quasi-renaissance outfit makes her look like the trained personal guard of a powerful spirelord, with her movements like those of a dancer: elegant but deadly. The model will yet need some more work, and I’ll need to find a warband for her as well, but I am now feeling really happy with the overall look of the model for the first time. 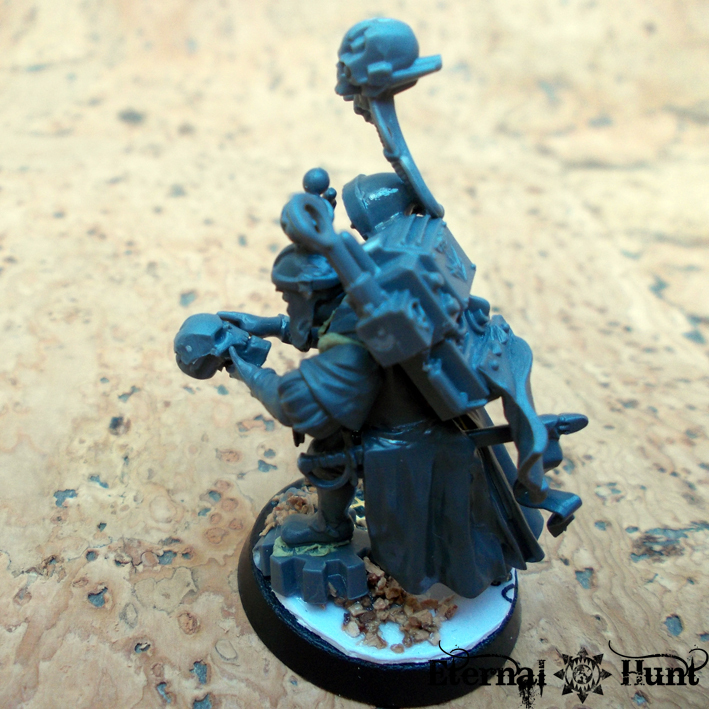 All in all, building some new INQ28 models – or combining existing models into a warband – is always a breath of fresh air. I hope I’ll be able to get some of these characters painted some time in the next weeks — let’s keep our fingers crossed! Oh, and let me know whatever feedback you might have, of course! First up, my kitbashed Daemon Prince. 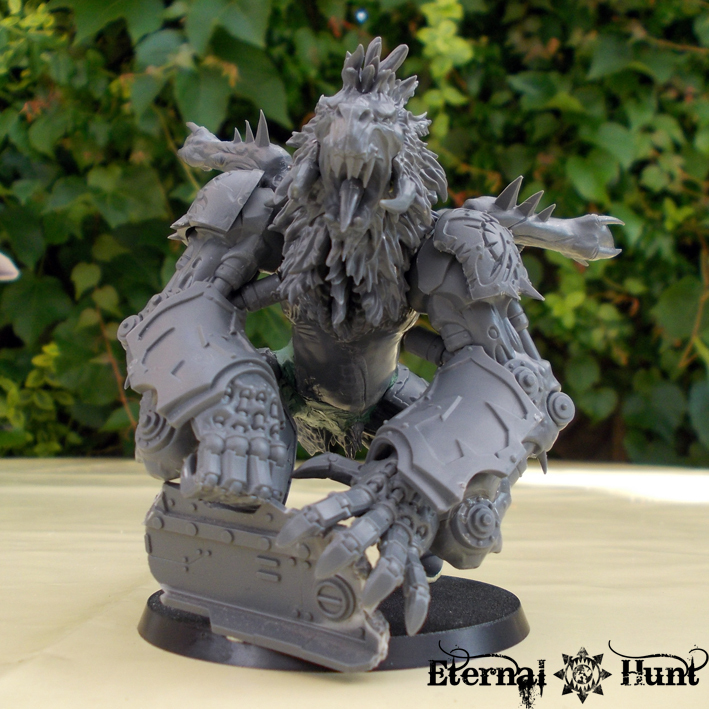 While reactions over here were pretty sparse, unfortunately, the forums provided more feedback this time around: I was happy to find out that the model was far better recieved than I had anticipated, plus I did get some extremely useful criticism out of the deal as well! So I ended up spending some more time on this guy, trying to take the various suggestions on board and further improve the model. (…)in my mind I keep seeing this guy bounding forward on all fours. In most of my visions of him, his front “paws” are on the ground, and his rear legs are kicked back in the air as he savagely runs at a target, like a wolf or a wild boar. On the off-chance the limbs are not all attached, I would experiment with lowering his chest and head toward the ground, and go for more a quadrupedal pose. I am pretty happy with the pose and think that this is really the best of both worlds: The left arm is still held away from the body in a more open pose, but now it somehow looks less like the Daemon Prince is giving one of his underlings a paternal pat on the back and more like he’s mid-swing while tearing something apart. But the Daemon Prince is not the only model on my desk: Having to wait for the various coats of (Liquid) GS to dry left me with some time to kill, which I used to revisit and touch up some older models. 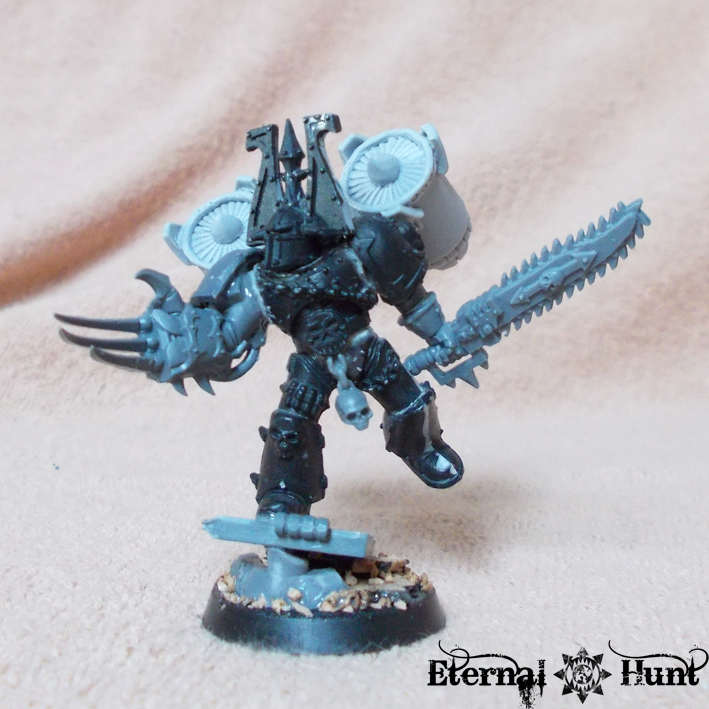 The first model is a fairly simple kitbash, just adding some new arms, a new head and weapon as well as a dash of chainmail to the existing berzerker body. I imagine all of these will look far less rough around the edges, once they are completely undercoated. I also added a MaxMini jump pack, since my other Raptor models so far are using the same bit. For this guy, I was feeling a little more adventurous, so I borrowed an idea I had seen on somebody else’s thread (GuitaRasmus’s, I believe) to build a more interesting looking weapon for him. 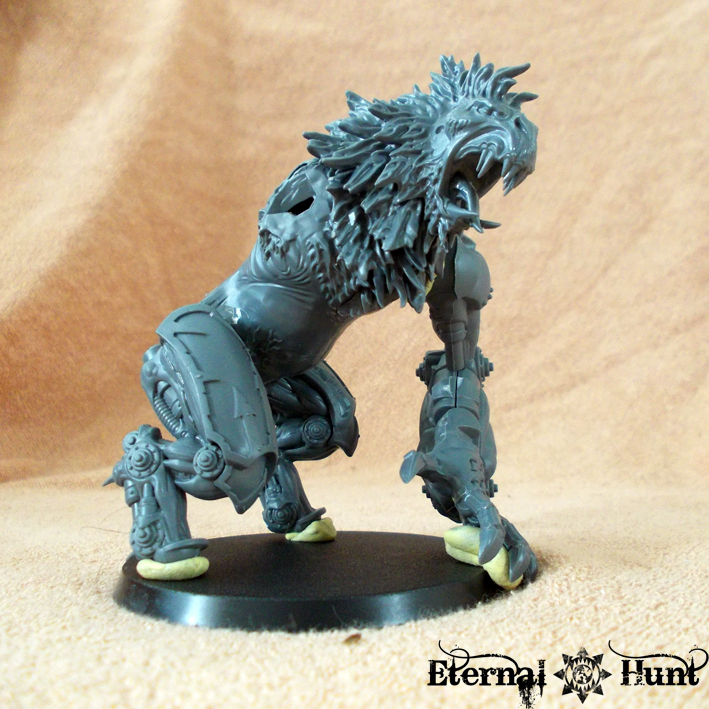 Once I manage to get those painted – whenever that will be – I will have quite a few Raptors at my disposal. 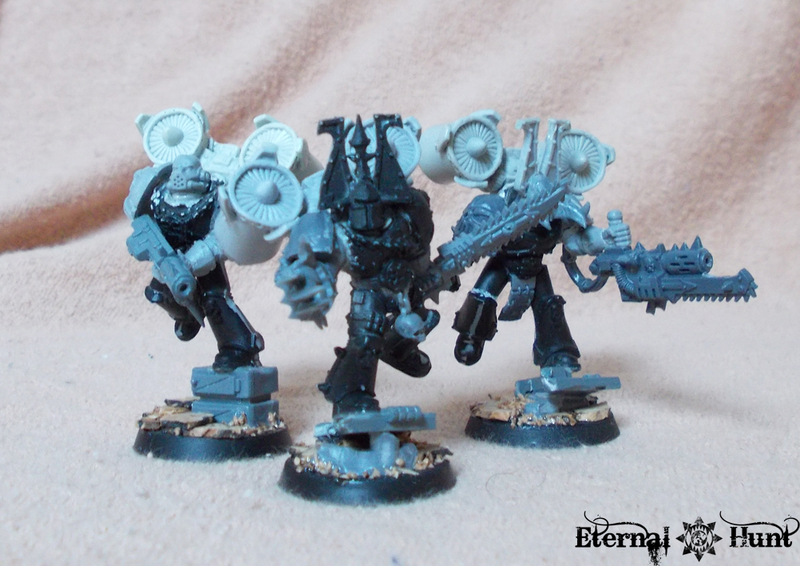 And I really like those guys, because they seem so right for a World Eaters army. Also, there is a special kind of joy in revisiting existing models after a while to give them a little extra flair and further improve them. Nothing big, though: I just added a couple of trophies and small weapons here and there, to make it look like these guys were used to living in the saddle. 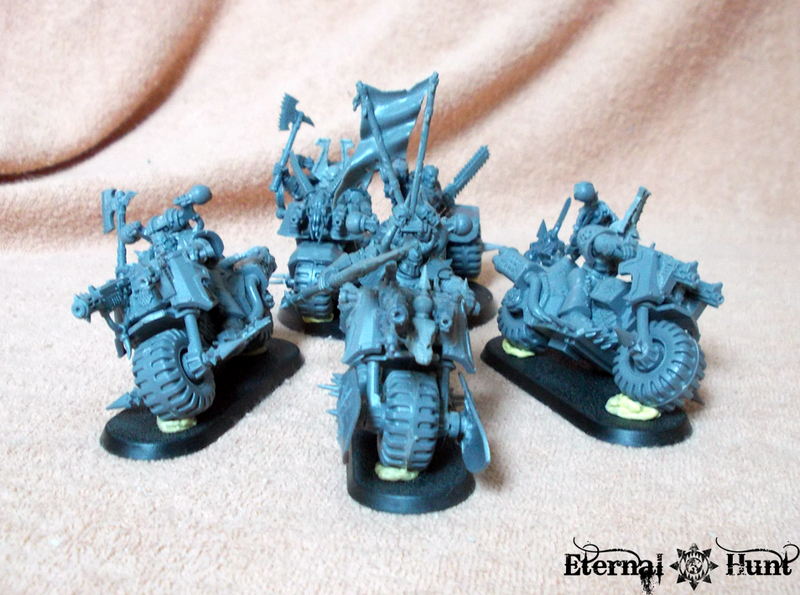 I also spent some time cleaning up the conversion work, drilling out all the barrels and exhaust pipes, etc. I only have the – slightly fuzzy – group picture right now, but I hope I’ll get around to showing you some better pictures (and maybe even more bikes) at some point in the future. 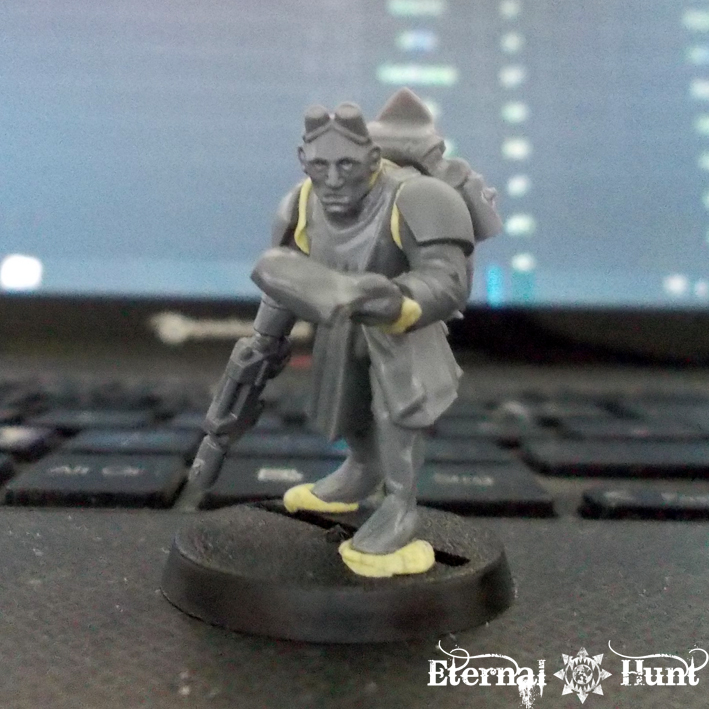 So yeah, as you can probably see, today’s post is not so much about breaking new developments as it is about incrementally doing small things that make your army better and better. Not as flashy as some huge centrepiece model, I’ll admit, but both approaches are important for an army, and both can be fun! I am always interested in your feedback, so let me hear what you think in the comments section! With very little time on my hands at the moment, I unfortunately lack the patience (and motivation) to crack out the paints and finally finish some of the stuff I have built, while my painting backlog is getting bigger and bigger. That is the bad news. But what do I have to show for it? Well, today I would like to talk abouta pretty long running project of mine that started out as merely wanting to do something productive with some leftover bitz and then quickly spiralled out of control, as will occasionally happen with my hobby endeavours. So what is this about? Everything started over a year ago, when cousin Andy gave me a WFB Chaos Lord on Manticore for my birthday. Now it shouldn’t surprise anybody that I quickly found a use for the fantastic Chaos Lord bitz that came with the kit: Some were used to create a wretched Chaos Sorcerer (to be used as a traitorous Primaris Psyker for my Traitor Guard), some others went into the creation of a Khorne Lord on Juggernaut that I have yet to show you. 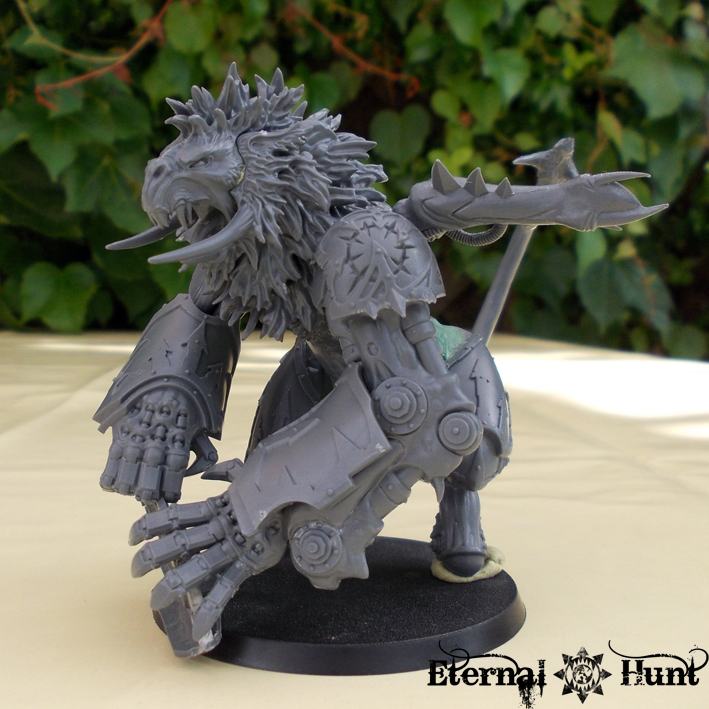 But when all was said and done, there was still a whole Manticore left, and I didn’t really have any good ideas for that guy: He was simply too fantasy to be seamlessly absorbed into one of my 40k projects. The one idea that seemed to have some merit, then, was to try and use him for building something daemonic. You see, my Khornate army is fairly short on daemons. And there’s a reason for that, of course: The image I have of my army doesn’t gel all that well with the stock daemon models: The warriors of the 4th assault company are doing their damnedest to keep functioning as a coherent fighting force, so it’s hard to picture hordes of daemons prancing around among them. 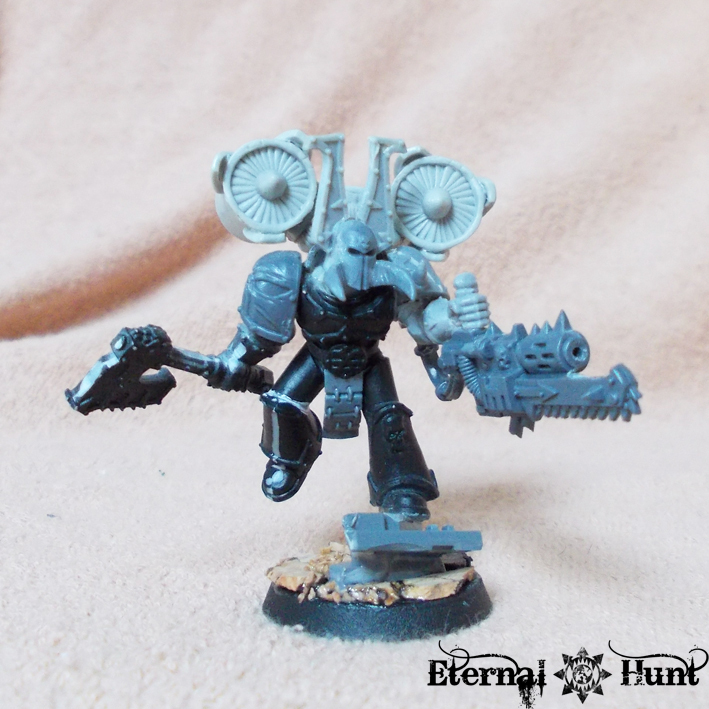 If I were to use any daemons, they would have to fit the look and feel of my World Eaters, and the most obvious way of achieving that would be to make them fit the underlying metaphor of Khorne’s Eternal Hunt. So instead of regular Bloodletters, I might use packs of (slightly) daemonic hounds, hunting ahead of the legionaries. 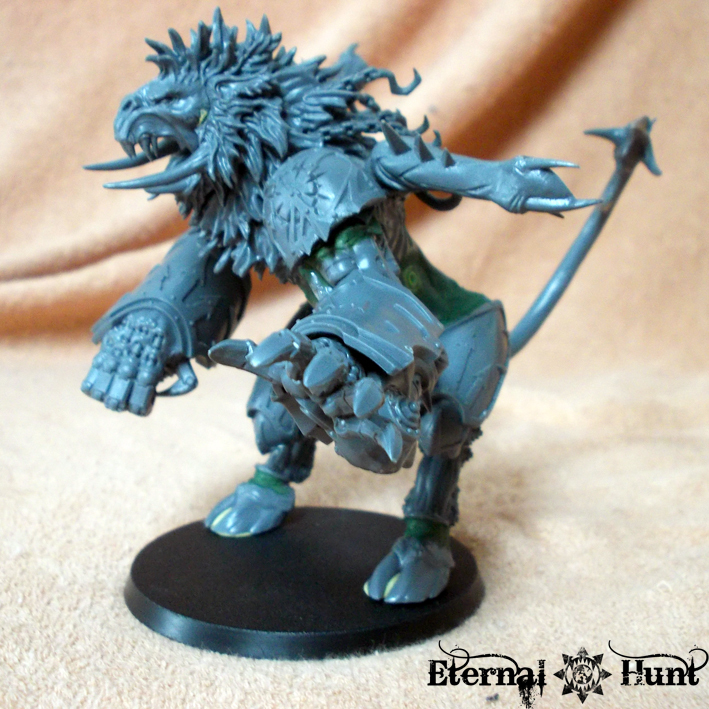 And instead of a standard Greater Daemon or Daemon Prince, I might use a huge daemonic beast an Avatar of the Hunt, if you will — hence my original idea to use the Manticore in that capacity. 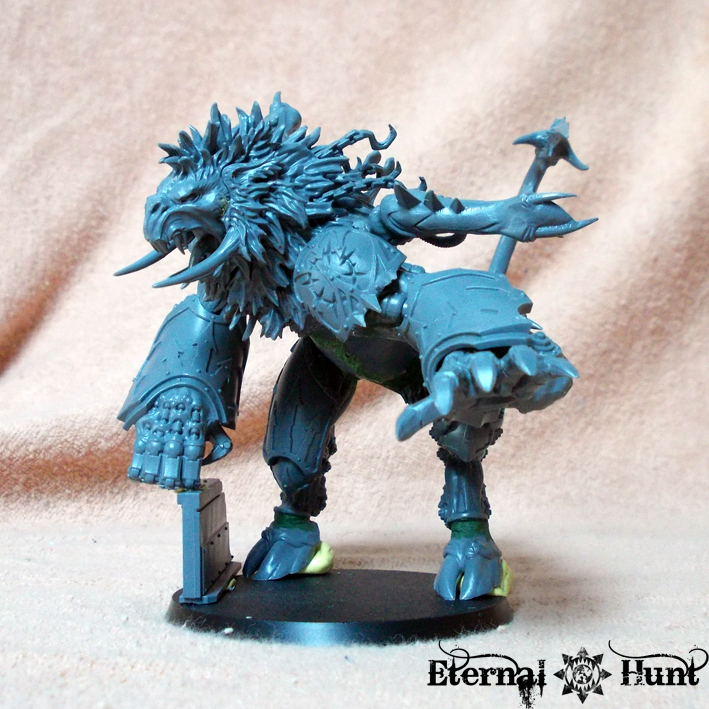 However, my plan to build a four-legged monstrosity – not unlike a titanic Flesh Hound of Khorne – didn’t quite get off the ground: I would simply have needed too much sculpting to make that work, something far beyond my abilities (and my patience). So back into the box the Manticore went. 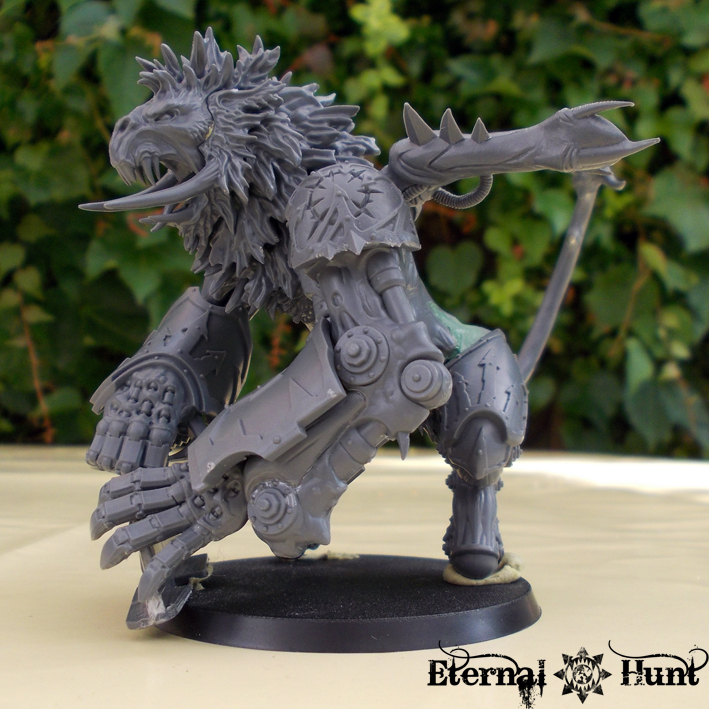 But then I came into the possession of some leftover Maulerfiend bitz, and my creativity was rekindled: What about using those to turn the Manticore into a hulking, biomechanic monster? 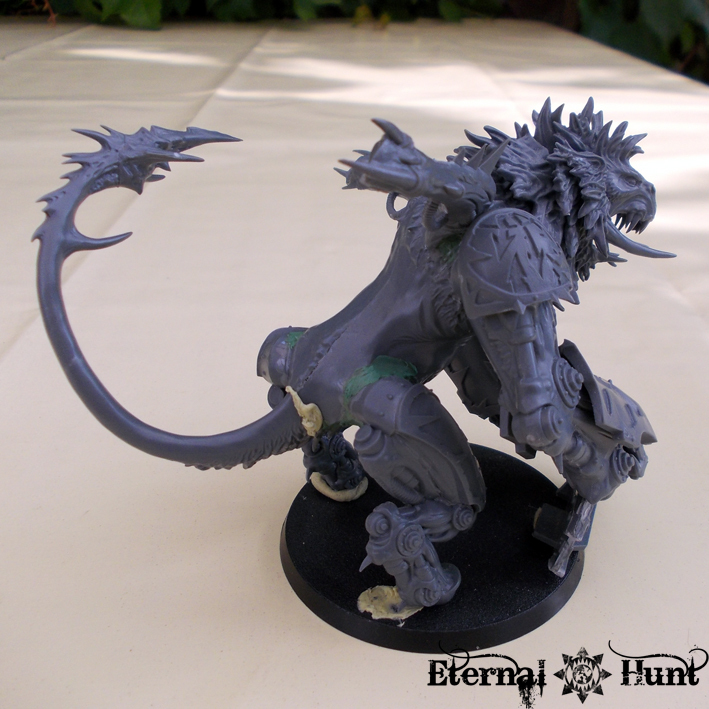 As you can see, the combination of the Manticore body and the legs and arms from a Maulerfiend led to a hulking, almost apelike silhouette. While the model seemed malproportioned and brutish, I rather liked the look, though. 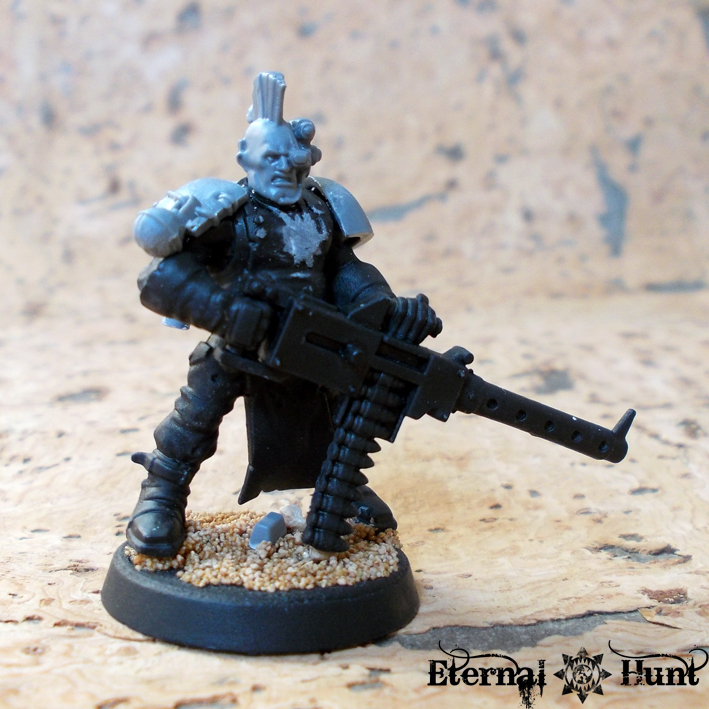 It also got me thinking what this model would actually represent in my army, beyond simply being a way of using some leftover bitz. You see, A Daemon Prince doesn’t really fit the background of my army for several reasons: Lord Captain Lorimar is the supreme commander of the 4th, for one, so there wouldn’t possibly be any DP with more authority than him, least of all serving under him. 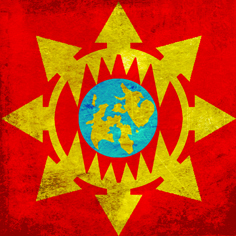 What’s more, I feel the ascension to daemonhood wouldn’t necessarily be seen as a boon by the warriors of the 4th: The legionaries have done their best so far to keep mutation and madness at bay, rather electing to remain “human”, for lack of a better word. For them, being elevated to daemonhood would not be an ultimate price to be craved, but rather a horror not so far removed from the curse of spawndom. 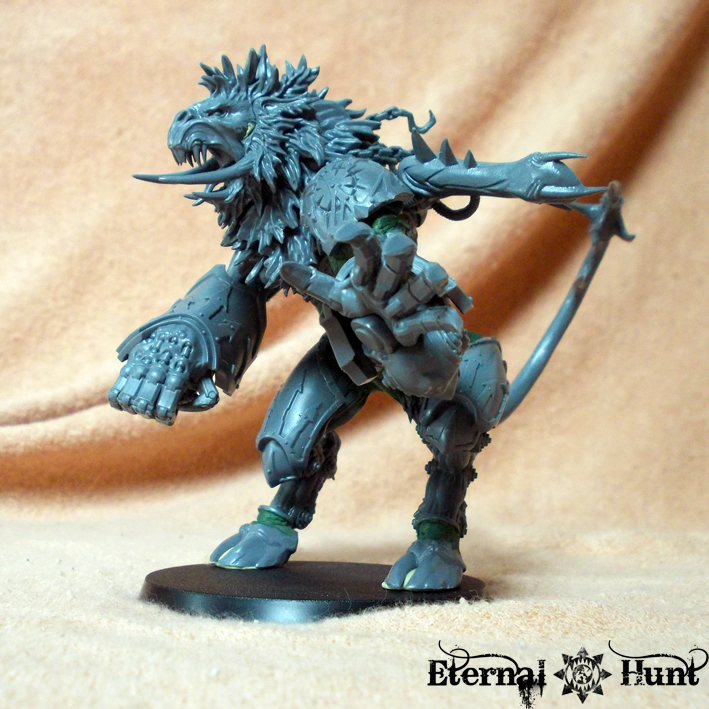 And with its hulking body, the WIP model seemed to reflect that: Where a “normal” Daemon Prince is a sinister, darkly angelic figure, and an embodiment of chaotic power and boundless ambition, I wanted my DP to look like this huge, malproportioned monster that is part ape, part hound and part Astartes. 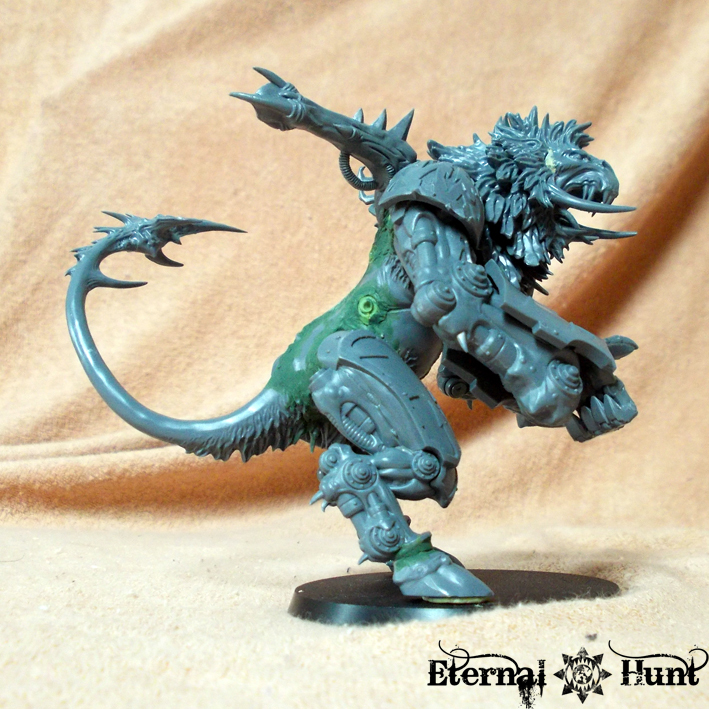 I imagine that, upon ascending, all the rage and fever for the hunt that a member of the 4th assault company has been bottling up for so long will overflow and turn him into a huge hunting beast, mindless and terrible. 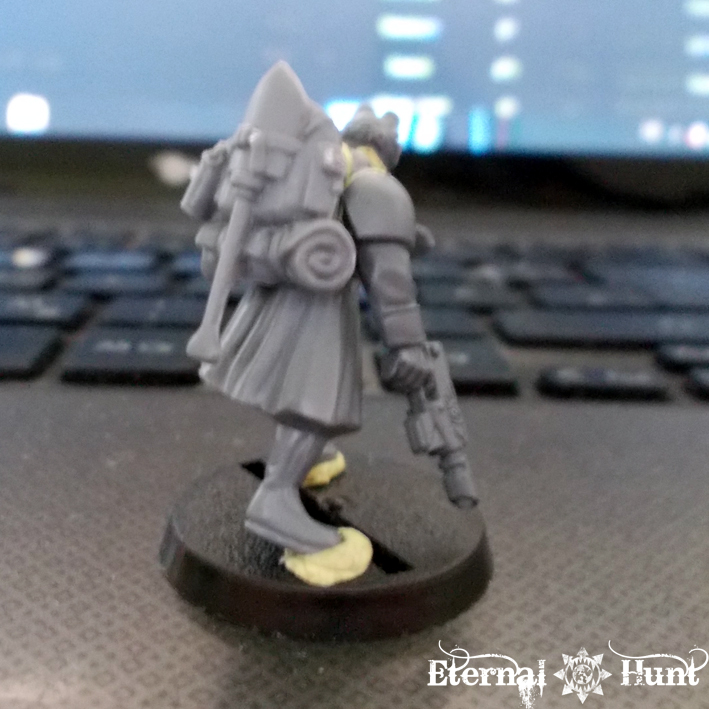 As you can see in the pictures above, I added the warped remains of a CSM backpack and the shoulder pads from the regular Daemon Prince kit to hint at this guy’s Astartes origins. 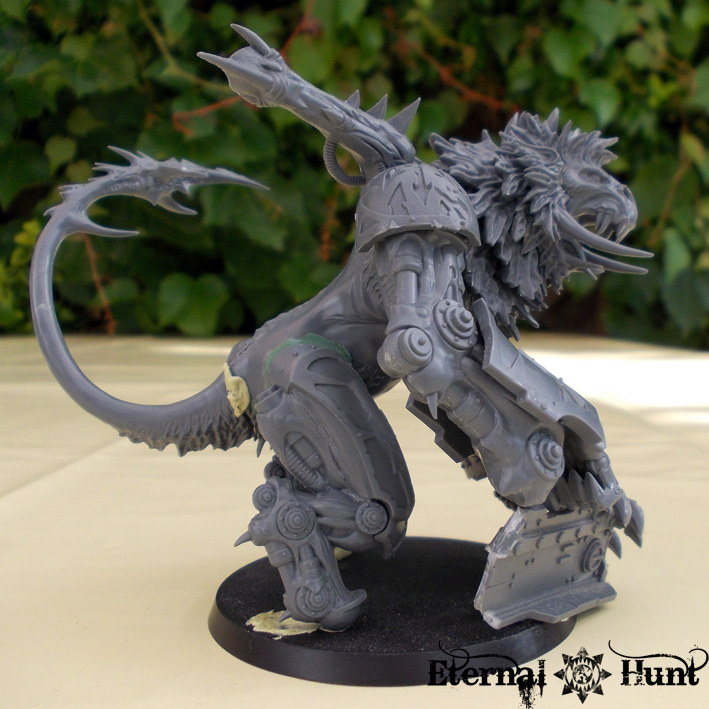 And the tail from the Manticore kit made the DP’s silhouette more interesting and ambiguous: The pose and proportions may seem pretty much like those of a gorilla, but the head and tail point more toward a hound or entirely daemonic creature. You might have noticed that the model was still lacking some feet at this point. 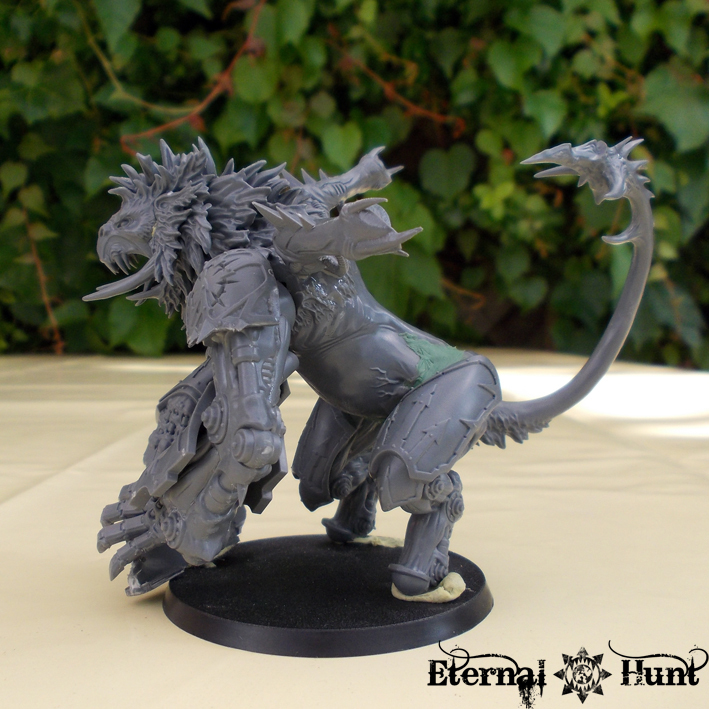 That was to become quite an issue, as fellow hobbyist Ben kindly sent me two sets of Maulerfiend hooves for this conversion, only for them to both be lost by those geniuses at the German postal service. Nuts! As you can see, I also changed the pose of the left arm to achieve a slightly different look: With both arms held in front of its body, too much of the model seemed to be obscured. The new hooves also gave the Deamon Prince a more upright pose than I had originally planned, and that particular element might need some more work. At the same time, more GS and Liquid GS were used to make the transitions between the different parts of the body more organic and plausible. 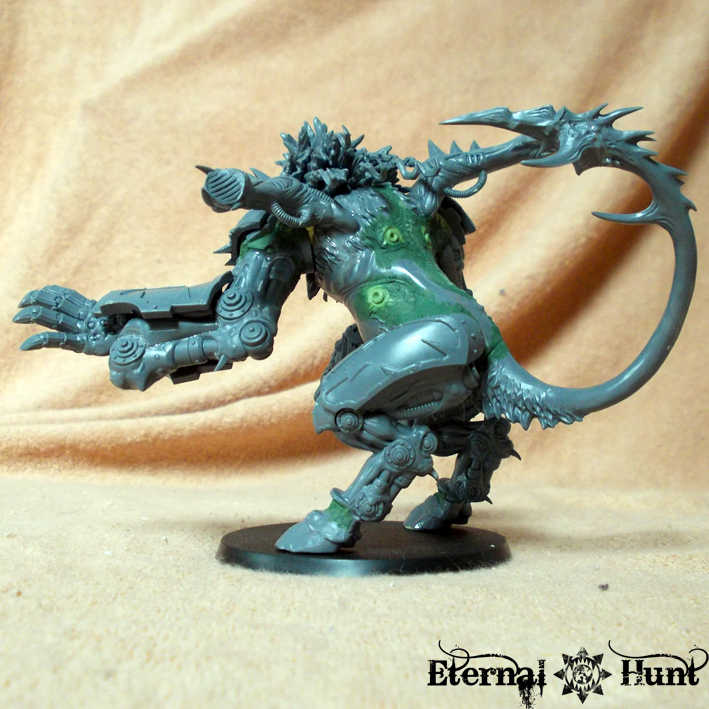 And I also emulated Dave Taylor’s really clever idea of adding metallic sockets to the creature’s body, using GS. 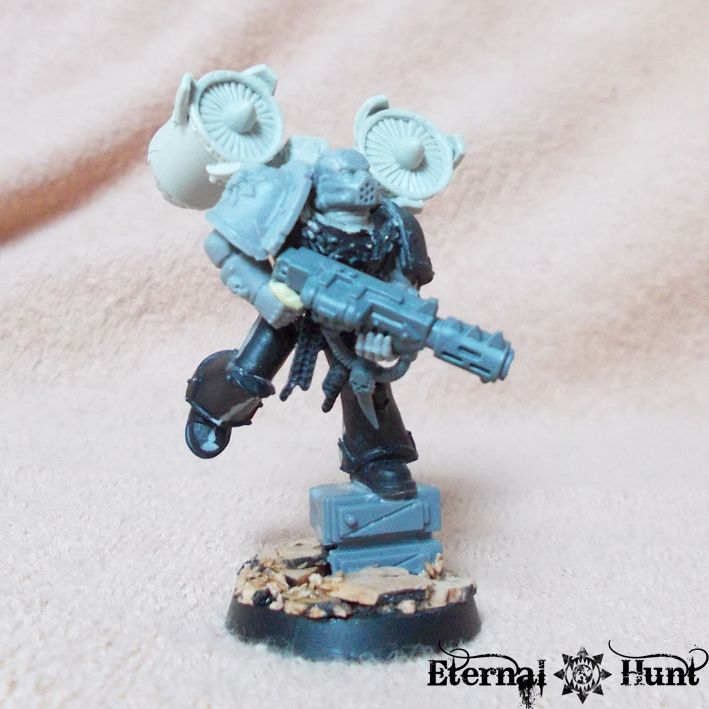 I did this in order to represent the ports that used to connect the former Astartes’s black carapace to his power armour (For all those interested, Dave succinctly explains how to create this effect here). While this project seems to come a bit out of the left field, I have really been working on this guy on and off for about a year now, and it seems like he’s finally nearing completion. 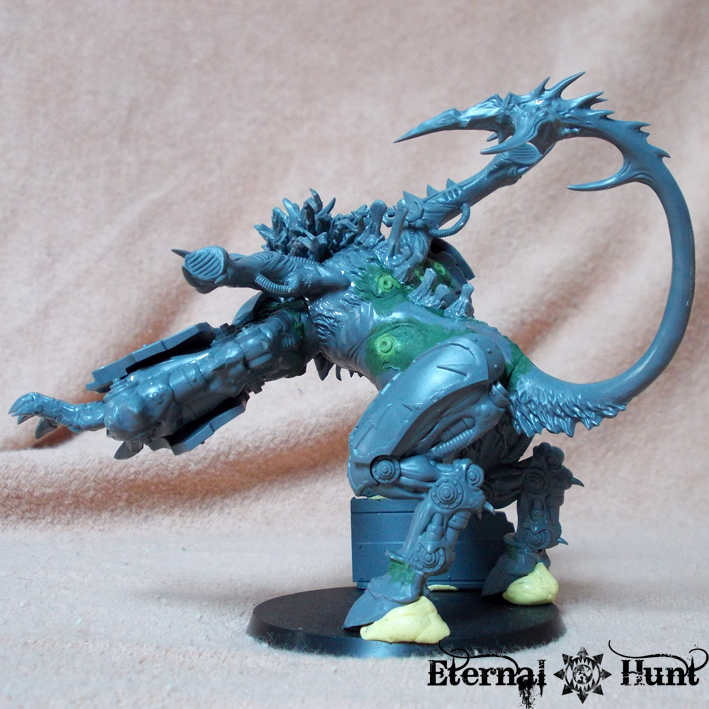 Much has happened in the meantime, and TJ Atwell’s fantastic “Bull God” , using a slightly similar premise, almost made me ashamed to show you this silly little conversion of mine. But then, I think that, with a bit more work, this could really become yet another model to define the specific look and feel of my army, and I like that a lot! 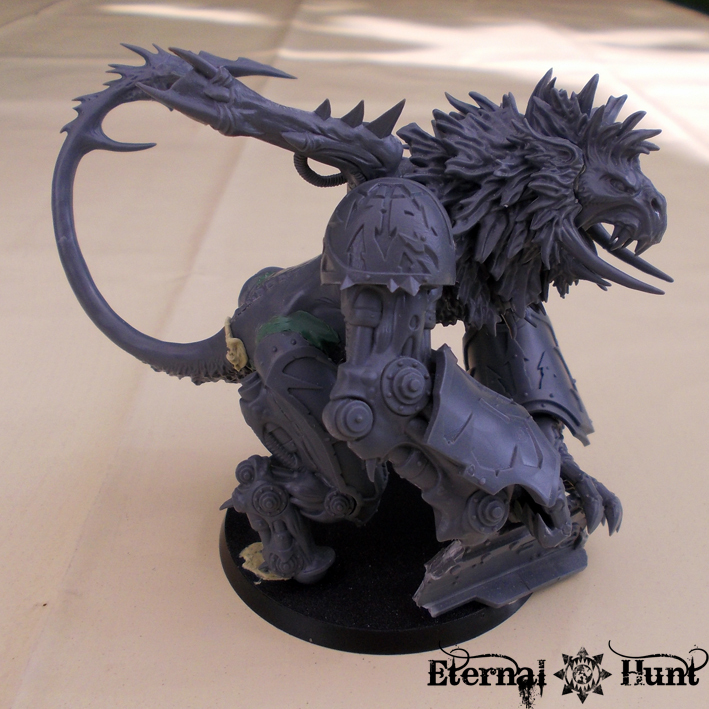 And in gaming terms, I imagine the model could even be used as a reasonably convincing GD or Maulerfiend: Maybe that spiky tail could even count as lasher tendrils…? Anyway, I realise that this model might be a bit of an acquired taste. But working on it has taught me a lot, and actually using these bitz for something is certainly preferable to keeping them in my cupboard of shame forever, right? That said, I’d be happy to hear any thoughts and ideas you might have! Let me know what you think in the comments section!